BELIZE CITY, Thurs. Apr. 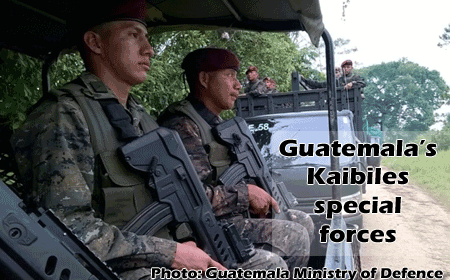 21, 2016–As we go to press tonight, the Guatemalan military has announced that it has dispatched its most dangerous special forces, the Kaibiles, partly trained by the U.S., to Belize’s western border in an unprecedented military mobilization by Guatemala, which appears to have begun soon after that country’s president, Jimmy Moralez, issued a public statement protesting the killing of a Guatemalan, 13, accused of illegal farming inside Belize. Morales, in a video message which went viral today, called for “a strict protection exercise over the sovereignty of the Sarstoon River and the entire adjacency line…” and the recall of that country’s Ambassador to Belize, H.E. Manuel Roldan Barillas, back to Guatemala. 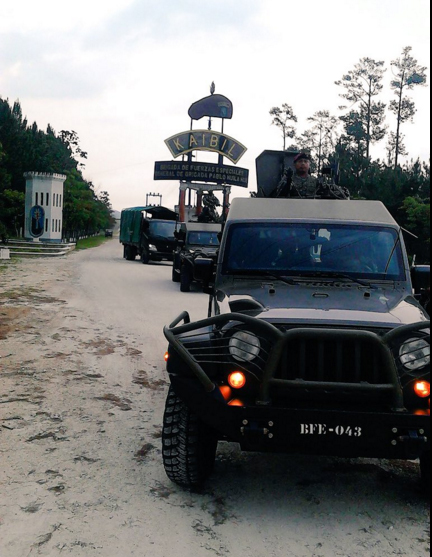 Several posts appearing on the Twitter feed of the Guatemalan military/Ministry of National Defence over the past few hours show snapshots of that mobilization, which includes detachments to the Sarstoon River, Belize’s southern border, as well as the western border, bounded by the Petén, where troops were photographed moving in armored military vehicles towards the border with Belize, presumably on orders by their military commander. Prensa Libre says 3,000 troops have been sent as reinforcement to the Sarstoon area and Belize’s western border, citing their defense minister, Williams Mancilla. 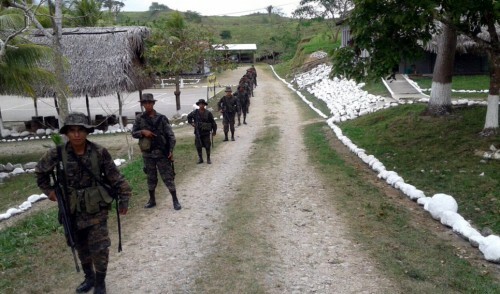 Guatemala deploys its armed forces to Belize’s western border, at Peten. Tonight, Amandala contacted Retired General, Colonel George Lovell, the Chief Executive Officer in the Ministry of National Security, and he told us that he is aware of a Guatemalan military build-up on Belize’s western and southern borders. “Our people are monitoring the situation on the border areas,” Lovell said. 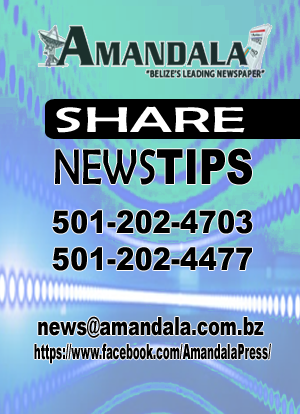 Amandala asked Lovell if Belize has any contingency measures in place, to call for ally countries to come to our assistance, if the situation escalates. Lovell told us that the Ministry of Foreign Affairs has engaged our friends and that Prime Minister Barrow, who is presently out of the country for the signing of the Paris Agreement on Climate Change in New York, USA, is convening a meeting of the National Security Council tomorrow. Lovell did not give a specific time when the Council would convene its meeting. Guatemala’s Jimmy Morales, in a statement to the Guatemalan people issued earlier today, accused the Belize security forces of human rights violations which he said Guatemala would report to the Inter-American Commission on Human Rights, an arm of the Organization of American States (OAS). For its part, the Belize Government, in an initial press release issued this afternoon, said that the Belize Defence Force soldiers came under fire and acted in self-defense. It added that the Government of Belize would request OAS verification to ascertain the facts surrounding Wednesday’s shooting incident. The incident was mentioned at a press briefing held this morning at the Philip Goldson International Airport, right before the departure of OAS Secretary General Luis Almagro. He told reporters that both countries have asked for verification but the OAS had not yet received any formal request from the parties. San Ignacio Police confirmed to Amandala this evening that Reyes is in their custody, but that he had nothing to do with the incident involving the BDF shooting of Julio Alvarado, the Guatemalan teenager who was fatally shot by the BDF. “Jose Maria Antonio Reyes was transferred to the custody of the San Ignacio Police, where he awaits an appearance before a Magistrate,” said the Government press release. “Belize has a long history and tradition as a peace-loving country, respectful of international law, human rights, and with a strong democratic culture where the rule of law has always prevailed. 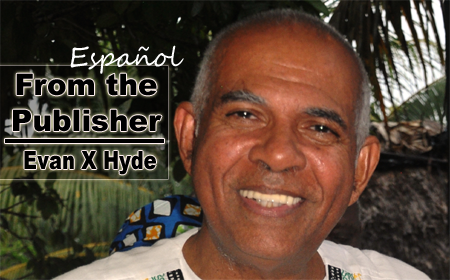 The Government and people of Belize always abide by these strong and unshakeable traditions. Accordingly Belizean Security Forces and law enforcement officials would never perpetrate an armed attack on civilians, especially minors, except in exercise of the right to self-defense,” the release stated. The release continues: “The Government of Belize reiterates that the mandate and authority given to Belize law enforcement and security agencies to enforce Belizean laws and protect Belize’s natural resources and territorial integrity is at all times implemented on the basis of recourse to the use of force only as a last and justified resort. But respect for life and rights must always include respect for the life and rights of Belizean law enforcement officials and security forces. In this case, the BDF reports of the incident indicate that our patrol in Belizean national territory came under attack, to which they responded in justifiable self-defense. It is to be pointed out that the patrol included civilian personnel from the NGO group, [Friends for Conservation and Development], and those personnel confirm the fact that our patrol simply responded after they were fired upon and were in fear for their lives. “This latest shooting attack on Belizean officials is part of a continued pattern of aggression by Guatemalan civilians engaged in illegal activities on Belize’s side of the Adjacency Zone. In this regard, the Office of the Prime Minister recollects the earlier attacks which resulted in the murder of Special Constable Danny Conorquie and the shooting of Sgt. Richard Lambey. “Belize wishes to remind the Government of Guatemala that both countries are committed to the Confidence Building Measures signed in 2005 which obliges both Governments to act responsibly in word and in deed when dealing with any incident that may occur along the border. 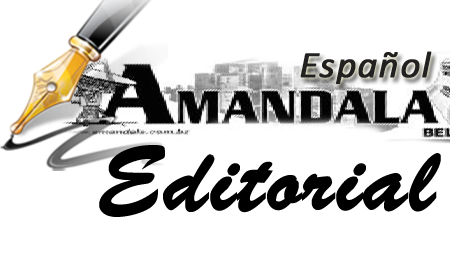 “In this regard, we find the statements made and position taken by President Morales to be unhelpful and inflammatory. 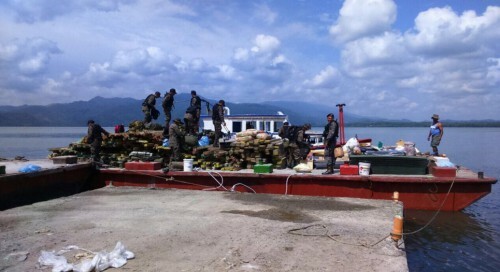 The current amassing of Guatemalan troops in the border areas, including the Sarstoon River, only adds volatility to the tensions already created by illicit activities in these areas. Whereas it is the wish of the Government of Belize to abide by the Confidence Building Measures, this does not appear to be the posture of the Republic of Guatemala. Guatemala rejected an 11-point protocol that Belize had put forward to reduce tensions at the Sarstoon between the Guatemalan Armed Forces and the Belize Defence Force. “People of Guatemala, with profound sadness and total condemnation of the State of Guatemala, I wish to communicate to our people that yesterday, members of the Belize Defence Force killed another Guatemalan, with the aggravating circumstance that this time, the victim is a 13-year-old. 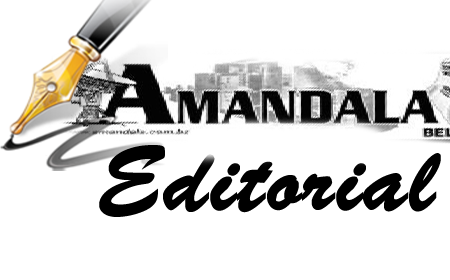 “The cowardly and unconscionable attack was against the child, Julio Ruano Rene Alvarado, a 13-year-old whose body still lies in the hands of the authorities of Belize. “In the attack, also wounded with a firearm were his brother, Carlos Alberto Alvarado, just 11 years old, and his father, Carlos Alvarado Alfredo Ramirez, 48, who were planting pepitos at the time. 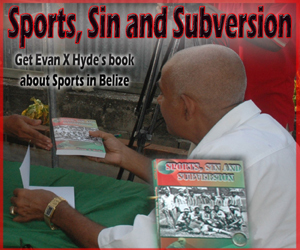 “I ask the authorities of Belize: what threat do two children pose to their sovereignty? One thirteen and the other, eleven years old? “1. That the Government of Guatemala demands that the Government of Belize places the person or persons responsible for the death of the Guatemalan minor before the authorities so they can be tried in the appropriate courts. “2. That we have informed the Inter-American Commission on Human Rights of this human rights violation by the Belize Defence Force against Guatemalan minors. “3. I am requesting from the organizations which look after the protection of human rights to investigate this cowardly act by the Belize Defence Force. “4. That considering the goodwill of Guatemala and the conciliatory work by our Foreign Ministry to find a peaceful and permanent solution to the claim we have with Belize, as well as with maintaining and developing good relations, which is not supported by such actions of Belize, we have decided that from now on, we will exert a strict protection exercise over the sovereignty of the Sarstoon River and the entire adjacency line, to ensure that further abuses on the part of the Belize Defence Force against the territory and the Guatemalan population do not occur. “5. That I have decided to call in our ambassador in Belize for consultation, until the authorities of that country clarify this unfortunate incident. In a statement posted tonight on Facebook by Mexico’s Ambassador to Belize, H.E. Carlos Quesnel, the Government of Mexico, the first to issue a public statement on the matter, said that it has confidence that an investigation by the OAS would help resolve the matter, and it expressed support for the OAS framework in promoting confidence building measures to avoid future incidents and tensions which threaten peace between the countries.